Bats are among the most fascinating creatures on the planet, and some of the best for the environment. A colony of bats can eat millions of harmful insects in a single night of hunting, and over time, the impact on the insect population is almost too enormous to contemplate. 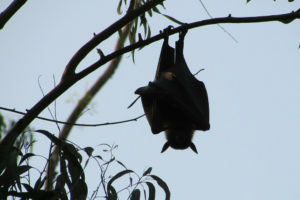 Many varieties of bats are also considered protected species, and harming them is against the law. If you see bats around your home, you should count yourself lucky, and just spend time watching them hunt potentially dangerous insects through the night. Having bats in your home is another issue entirely. Having bats outside your home allows you to enjoy the beauty of nature and watch these amazing hunters in action, but having bats inside your home can put your house and your family at risk. Bats may be fascinating creatures, but they are also common carriers of rabies and other diseases. If you see a bat in your home, you should never attempt to catch or relocate it on your own. Instead, you should contact Contractor’s Best Pest Solution right away, so we can deal with that bat infestation for you. If you see a single bat in your attic or elsewhere in your home, you can be sure there are plenty more where that one came from. Bats live in colonies, and those colonies can consist of hundreds or even thousands of individuals. If you see a bat flying through your home or encounter one in your home, chances are there is already an established colony of the creatures living in your attic. At this point, you can explore on your own, but it is better to call in the experts. Exploring your attic on your own could mean encountering a bat, and that could put you or your family members at risk. Instead of trying to deal with the problem on your own, and possibly harming a protected species, just call Contractor’s Best Pest Solution for help with your bat problem. If you are as fascinated with bats as many people, you may be worried about calling in a pest control company to deal with them. You may worry that the bats will be harmed or even killed, but with Contractor’s Best Pest Solution, you can put those concerns to rest. At Contractor’s Best Pest Solution, we understand that bats are protected species, and we will can assure you that no harm will come to them during their removal. We will relocate your attic-dwelling bats safely, so you can get on with your life and the bats can get on with theirs.